It’s time for some decorations and food fun for Christmas in July! 1: Press a Styrofoam circle into the top of a wooden dowel. 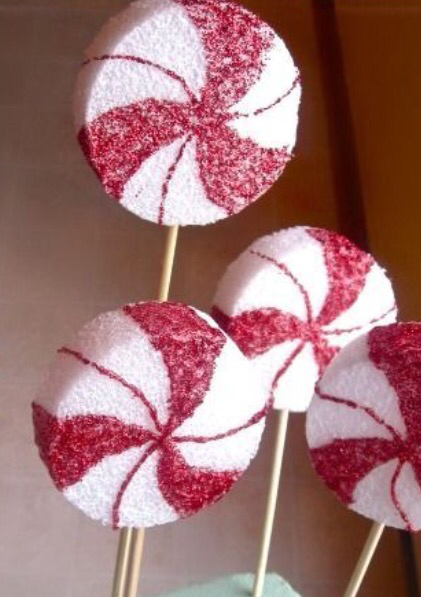 2: Decorate similar to a peppermint. Fun to place around a house, office space, and more! 1: Crush the peppermints in a ziplock bag. Place one marshmallow onto the bottom end of a wooden dowel. 2: Melt the chocolate, in either the microwave or onto of the stove, and dip the marshmallows. 3: Roll the marshmallows into the peppermint and let harden. You can place in the refrigerator, if needed to quicken hardening. 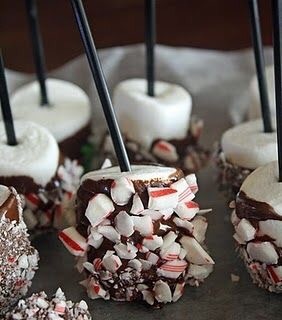 This entry was posted in Uncategorized and tagged candy cane, Christmas, Christmas in July, decoration, diy, food, food network, holiday, july, pinterest, recipe, southern belle, summer, winter by METAYLOR. Bookmark the permalink.